Tribute to the Beach Boys – Endless Summer Beach Bands is a fun interactive show which features the great music of the Beach Boys and their many hit songs. The show is biographical and takes the audience on a journey of how the Beach Boys were inspired by Chuck Berry and The Four Freshmen. Great care has been taken in reproducing the authentic look, vocal harmonies and the instrumentation of the original performers thus capturing their very spirit. The show includes experienced singers and musicians who have played countless shows over the years. 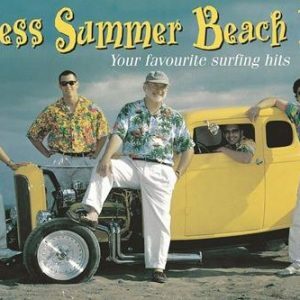 Included in the show is a variety of summer songs from the 60’s that complete not only the Story of the Beach Boys but the story of summer itself. Beach Party Boys will leave audiences feeling like teenagers when they first heard the Beach Boys during those hot summer days. Jamie is hailed as one of the best musical directors in the business. He honed his craft as musical director at the Deerhurst Resort in Northern Ontario, for a young Shania Twain, and followed by “Legends Alive”. Jamie is meticulous in detail, assembling the best musicians, to ensure the roper instrumentation and presentations. His work ethic, along with his virtuoso guitar playing has earned Jamie the respect of musicians and performers around the world. Neil’s experiences as a drummer have spanned over 40 years. Starting with 60’s rock ‘garage bands’, Neil went on to playing varied musical styles with a number of dance orchestras in the 70’s, followed by a ten year stint in Toronto’s highly acclaimed “Remember When” 50’s-60’s rock revival band. After almost twelve years of work for “Legends Alive” and similar tribute shows, Neil adapted his drumming skills to play the congas, bongos and other various percussive instruments especially designed for Camp Rock Revisited.